Everyone remembers their first bike despite the scrapes & bruising but SOLIDWORKS take us right back to the first ever bike & how it's design has progressed since then. Stridewalkers, Boneshakers, Penny Farthings. The bicycle has been privy to some curious iterations. Fetch your helmet, here’s a whistle-stop tour of the bike’s 220-year history. Who needs nuclear power when you’ve got a bicycle? That’s what the nation’s listeners of UK Radio 4 programme You & Yours decreed in 2005 when they voted the bicycle as the most significant technological innovation since 1800. In winning the poll – emphatically – the humble bike also batted away competition from the computer, radio, the internet, communications satellites, internal combustion engines and the germ theory of infection. Not bad. But what’s so special about two wheels, a frame and a saddle? Well, it turns out there’s rather more to it than that. So much so that today’s performance bikes are as much the work of F1 engineers as bike manufacturers. Yep, the bike’s wheels have rolled an awfully long way since the clunky wooden specimens of the eighteenth century. Today the world’s one billion bikes represent the most efficient vehicle the world has ever seen. 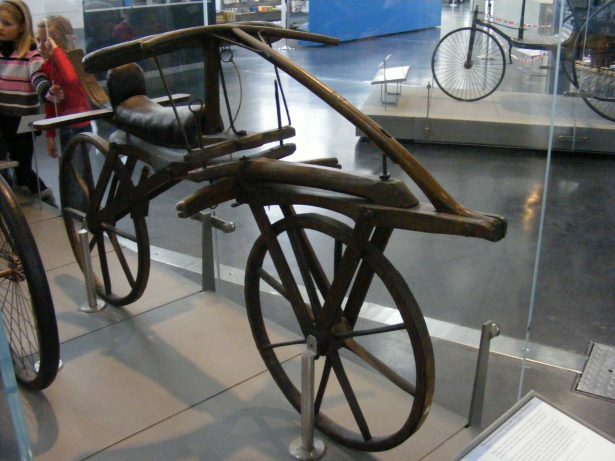 1817: The world’s first bike? Step forward German inventor Karl Drais, who in 1817 patented the design for his Laufmaschine(translation: running machine). Riders straddled a wooden frame and – in the absence of pedals and chain propulsion – pushed their feet along the ground to get the wheels moving. Hence the distinctly sci-fi sounding nickname: Stridewalker. Kirkpatrick MacMillan, a Scottish blacksmith, makes what would become the most influential addition to the story of the bicycle: a mechanical crank-drive system attached to the rear wheel. Hello pedals, goodbye scuffed shoe soles. Building on MacMillan’s crank-drive innovation, Pierre Michaux (another blacksmith) and his son Ernest developed the world’s first mass-produced bicycle in 1863. It was called the velocipede and had flanged wheels that endowed it with the unique ability to ride along rail tracks. Hmm. Back on the cobbled streets of the nineteenth century, the wooden-rimmed wheels were particularly unforgiving – earning Michaux’s bicycle the nickname ‘Boneshaker’. It might have looked ridiculous, but the Penny-Farthing was built to serve a very practical need: the need for speed. Without gearing, the only way to increase bicycle speed was to increase the size of the wheel attached to the pedals – and the enhanced availability of steel meant large wheels were a simple engineering challenge. Unfortunately, penny-farthings were incredibly difficult to mount, much less ride, and became the preserve of the brave, the skilful and the foolish. 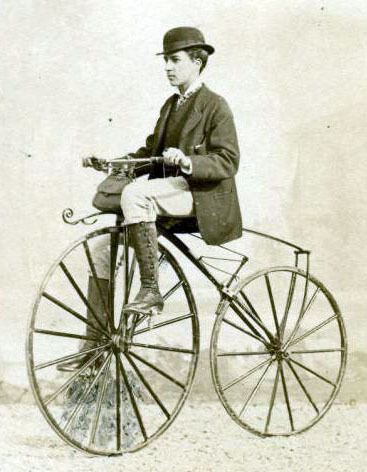 During the late 1870s a number of inventors developed an alternative to the penny-farthing, marketed as the safety bicycle for obvious reasons. With a chain drive that allowed the rider to sit at the centre of the frame, a height that made it easy for riders to reach the ground and wheels that were broadly the same size, the safety bicycle fuelled the surge of bicycle popularity in the 1890s and the birth of companies such as Raleigh and Schwinn. The same design is used to this day. Yep, for the last 140 years all we’ve been doing is tweaking a design classic. Scottish veterinary surgeon and inventor John Dunlop is the first to add pneumatic tyres to a bike while successfully attempting to make his son’s tricycle safer. He then brought his innovation to cycle racing and it was quickly adopted. The following fifty years was a time of major innovation in terms of gearing, brakes and derailleurs. Italian bicycle component manufacturer par excellence Campagnolo invent a derailleur called the cambio corsa. It’s revolutionary. Instead of stopping and flipping their rear wheel to change gear, riders can simply flick a rod located above the rear wheel. The 1980s were the dawn of an era of serious engineering innovation for bikes. Suddenly the everyday consumer could purchase BMXs, mountain bikes, road bikes, commuter bikes, elite racing bikes, tandems and more. One of the most major innovations of the 80s comes when manufacturer Look produce a racing bike with a carbon fibre frame. 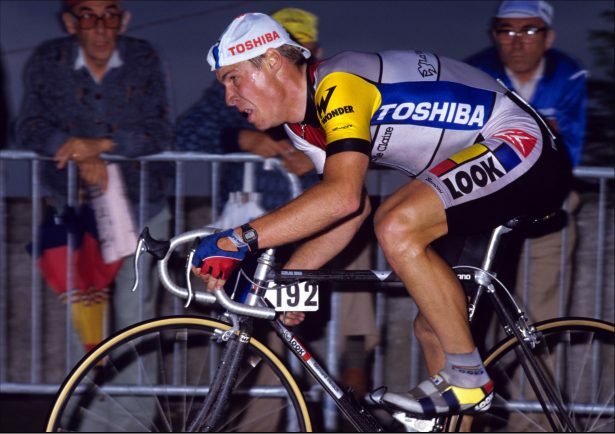 Ridden by Greg LeMond, Look’s KG86 wins the 1986 Tour de France. UCI, the governing body of cycling, define what a bicycle is. All race bikes must abide these parameters and bicycle engineers everywhere have a strict set of limitations within which to innovate. What’s the future of bikes? The UCI parameters mean that the basic design of bicycles for competitive races isn’t going to change anytime soon. That doesn’t mean visionaries can’t have their fun with concept bikes and commuter bikes. Oh and lest we forget the revolutionary trikes that Van Raam have developed in SOLIDWORKS for those with mobility issues and their carers.